"I have one question. Is this the beginning of my journey, or the end?" Chris Carter created something of a phenomenon with the long-running series The X-Files, and though it ended with a whimper instead of a roar, it largely delivered what it was supposed to. Using the creative leverage from that show's success, Carter was given the chance to flex his darker side with Millennium (along with key X-Files writers Darin Morgan, Glenn Morgan, and James Wong), which debuted in 1996 on the Fox network. It only lasted three seasons—ironically getting axed before the actual end of the century—but in hindsight it was the perfect amount of time for the show to run its increasingly grim discourse on the End of Days. Carter's actual involvement was minimal in the second season—with The X-Files film underway—and the team of Glenn Morgan/James Wong were really driving the bus for the principle set of episodes in this block. At the show's center was grizzled and craggy Frank Black (grizzled and craggy Lance Henriksen), a retired FBI profiler who has been cursed with some sort of sixth sense that allows him to literally get inside the criminal mind and to see things as they see them. This inate ability has, over the years, taken its toll on Black's sanity, and his retirement proved to be relatively short-lived. The first ep of the first season had Black relocating to Seattle, to presumably spend more time with his wife Catherine (Megan Gallagher) and his young daughter Jordan (Brittany Tiplady), but he is immediately courted by the mysterious Millennium Group, who desperately need his special talents. A series of brutal murders relunctantly draws him back in, though the true scope and intent of the Millennium Group is only hinted at during the first season, with Black's main group contact being Peter Watts (Terry O'Quinn), a multi-layered character with his own share of secrets. While the first season gradually shifted from a "serial killer of the week" format, it is the 23 episodes of the second season where Carter, Morgan, and Wong moved move full tilt towards the more Y2K-friendly story arc that would carry the show through its remaining days. As Frank Black struggles to resolve some very personal issues (such as the near-fatal kidnapping of his wife, leftover from the end of season one)—as well as a number of standalone episodes—the apocalyptic duality of the Millennium Group is revealed in neat little breadcrumb fragments, with Black left dangling precariously between two internal warring factions by mid-season. Carter, Morgan, and Wong merge feverish end-of-the-millennium fears, all carved out of increasingly darker, deeper folds of faith and religion, with massive governmental conspiracies that all direct the second season towards a final set of episodes that become some of the most fundamentally bleak and grim to have ever appeared on regular series television. As the relationshp between Black and Watts becomes more adversarial, and Black's own personal life goes to hell, the second season introduced a new recurring character in Lara Means (Kristen Cloke), who has her own extrasensory baggage to deal with. Perhaps it was an attempt to Scully-and-Mulder-ize the show, but Means becomes a strangely appealing counterbalance to Black, with her angelic visions playing well against Millennium's increasingly dire storyline. For me, Lara Means earned her role in television history during The Time Is Now, the season's final episode, in one of the most daring and unconventional sequences of the past decade; it is easily the equivalent of anything David Lynch did with Twin Peaks, and it runs for nearly nine minutes. If you've seen it you know what I'm talking about, and if you haven't it makes this Season Two set a mandatory rental, if nothing else. The emotional impact of Patti Smith's Horses will take on an entirely new meaning afterwards. Though there is a continual building toward the show's dominant End of the World theme, the number of memorable standalone eps is just as strong during the second season, and some of the better ones actually have a surprising amount of humor to them. Jose Chung's Doomsday Defense is an uncharacteristically comic crossover from The X-Files third season, once again from writer Darin Morgan, with Charles Nelson Reilly reprising his role as an author who just may know too much about a serial killer's next intended victim. The creepy funny continues in Somehow, Satan Got Behind Me (another Darin Morgan script), in which a quartet of old demons (including Bill Macy) recall their past exploits of tempting the darkside of man over coffee and donuts, with all of them realizing that they've encountered the immutable presence of Frank Black at some point. There are a lot of demonic forces at work in the continuing Millennium mythos, and pound for pound this was an insurmountably forboding show, with its reliance on strong biblical undertones (both light and dark) wreaking havoc on a weekly basis; the writing hammered hard on the presence of Evil, and the series travelled down some unexpected paths during this second season. But even with the Millennium Group's frantic and deadly search for holy relics (The Hand of Saint Sebastian, Owls), the pre-Da Vinci Code themes of descendants of Jesus (Anamnesis) and the spread of a prophesized deadly global virus (The Fourth Horseman), we do get brief glimpses of Frank Black's past (Midnight of the Century), which includes an appearance by Darren McGavin as his father, and an introspective look at becoming what you despised (The Curse of Frank Black), set appropriately enough on Halloween. As much as I enjoyed The X-Files, it did drag on for too long. 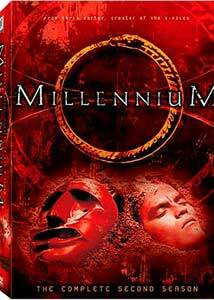 In the end, three years of Millennium seemed just about right, with this second season (thanks to Carter, Morgan and Wong) being its zenith. Image Transfer Review: Unlike the first season, it is nice to see that Millennium: The Complete Second Season has been issued in 1.78:1 anamorphic widescreen, slowly becoming a trend in television boxed sets. This isn't the most cheery-looking series, but colors look bright when needed, such as Frank Black's unnaturally vivid yellow house, but the bulk of the visual palette is set in deep browns and dirty reds. The strongest element is the depth of the blacks, which was always a weak spot when I originally watched the series during its network run. So much of the drama is built around dark, shadowy visuals, and the transfer on this set is a huge improvement. The image detail is dramatically sharper here, and though there is a bit of grain, compression issues are minimal. Audio Transfer Review: Audio is provided in a fairly active 2.0 surround mix, and all of the eerie mood-setting Mark Snow music—especially the haunting theme—have an improved richness and a deeper bass line. Clarity of dialogue, long an original problem of the series thanks to Henricksen's low mumble of a voice, also gets a much needed boost here. French and Spanish 2.0 tracks are also included. Extras Review: Millennium: The Complete Second Season gets the red-headed stepchild treatment when it comes to episode commentaries, with only two spread across 23 episodes. Director Thomas J. Wright handles the chores on The Hand of Saint Sebastian while writer Michael R. Perry offers his take on The Mikado. Both are pretty informative tracks (though The Mikado seemed a strange choice, considering some of the other key eps), and of the two, I enjoyed Wright's comments the most, but perhaps that has something to do with the mythos arc of that particular episode. There are, however, a couple of fine documentaries on Disc 6, kicking off with the comprehensive Turn of the Tide: The Making of Season Two (33m:33s), which goes into great detail on the machinations of this pivotal season. Academy Group: Victimology (24m:21s) goes the other way and looks at the real-life group that Chris Carter based Millennium on. Each episode is cut into 15 chapters, and features optional subtitles in English or Spanish. You may not want to step into this second season set without having seen the first, because even though there are a number of solid standalone eps here, the underlying principle story arc is rapidly expanded with this release. Call me a completist, but it's just not fair to start with Season Two if you want to absorb the whole dark experience.